Bambrella Sirocco 2.5m Round Spuncrylic Parasol: Bambrella Sirocco Parasol is the entry level range of parasols by Bambrella and represents excellent value. The main hub is made from nylon which is durable and allows for quick and smooth movement of the canopy. 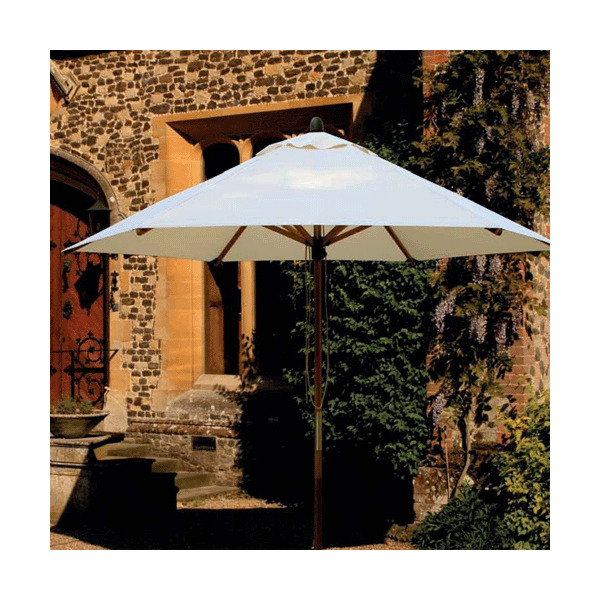 The Bambrella Sirocco Round Parasol is hassle free as you don’t need to use a pin to lock the canopy in place, the patented locking cleat will clamp the nylon in place. Despite the more affordable pricing the parasol does not compromise with features and still includes the three key points of bambrella design: Durability, Strength and Style. Spuncrylic® is polyester that has gone through a process called solution dying giving it a high resistance to fading from sunlight. Spuncrylic® also has good stain resistance and water repellence. In addition it has a UPF of at least 50. This material has a similar performance to acrylic but at a much more affordable price.